The bounty of nature's harvest comes together in deluxe assortment of premium nuts and dried fruits. 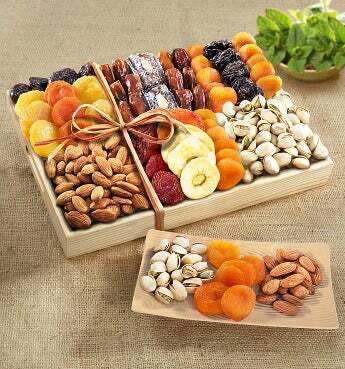 The natural wood tray is brimming with dried pears, Blenheim apricots, peaches, apples, dates, roasted salted almonds, pistachios, and more. It's a gourmet gift that is sure to please!